The Nitro Woodcarver was a super fun ride and it really lives up to it’s name it’s a super fun board to turn and has a really dynamic feel underfoot. It’s not as directional as it looks compared to most with a similar look. It’s very close to being a double ender in terms of tip/tail width, has only a -20mm set back on side cut and it carves well between the feet and off the tail. It’s got more set back on board though so it’s going to do well in powder too. We also liked the play on side cut and it did feel like it not only enhanced the grip but the turn as well. We only had a few runs on this but we really wanted to spend more time on this and compare it to some of our favorites. It’s definitely a board that shines for those that like a springy rewarding turn to carve but the early rise rocker in the tip/tail seems to round out the ride so it’s a good ride from hard snow to powder. Conditions: Pretty good PNW conditions with some decent groomers and a little something in the trees to slash around. We try to get as many images of the Nitro Woodcarver, but forgive us if they're not all there. I wanted a board I could use for most conditions. I dont do park, and I wanted to progress with my carving. This thing is perfect. Carves like a dream and rides good in all powder except super deep. I feel like it rides best off the back foot with a more set back stance. I would say it rides a little bit surfy, but not loose. At first I thought 159cm was a bit too big, but once I set the stance back a bit and rode it in different conditions, it feels right. What I liked most about the Good Ride reviews of this board is how much it matched my own experiences. Just like with the Good Ride guys, I demo'd this board and then could not get it out of my head. The first time down the mountain I said, "I think I REALLY like this board." The second time down, I said, "I KNOW I REALLY like this board." I wanted to buy the board right then and there. But it was not on the market yet and the demo board was not for sale (the Nitro guys were keeping it for themselves to demo). I ended up pre-ordering it and being one of the first to pick one up from my local board shop. I'm an intermediate boarder, trying to work my way up to advanced. Despite the fact that I can't necessarily take advantage of everything this board does well, I loved it from the start for two main reasons. 1) How effortlessly it initiates turns. 2) How stable it is when just going straight and fast. Those two things really make this the board for me. It may not spin as easily as a rocker board, but it is the most responsive traditional camber board I've ridden. It never "fights" me when I'm trying to initiate a heel-side or toe-side turn. And when I'm just riding it flat,it is uber stable. I never feel like it has a mind of its own like rocker boards I've ridden. The reviews by Good Ride used the word "fun" over and over and I couldn't agree more. It's just fun to ride. I paired it with some Nitro Team bindings, which were stiffer than what I'd had before but I really think this board is most fun with stiff bindings because they make its responsiveness even better. If I had to find fault with the board, I guess I would say that it's hard for me to ride switch (but what would you expect from a directional board?) and I'd have to agree that it is not the *most* floaty board in deep powder. I've ridden it in deep dry powder with no problem but if the powder gets heavy, I find I have to work a bit to get my weight back and get the nose up so it doesn't bury itself. 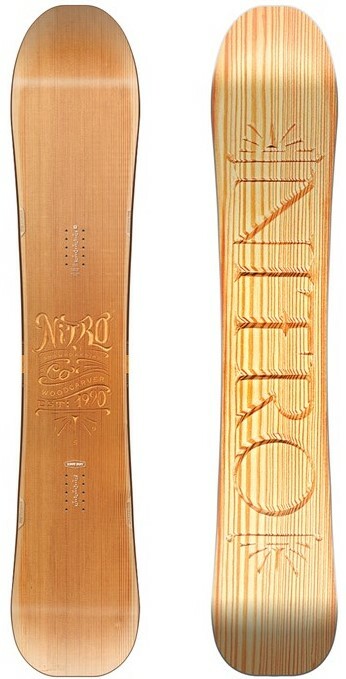 That being said, I have a "powder" board (Slash Straight) and I haven't ridden it once since got the Nitro Woodcarver. I enjoy riding the Woodcarver so much more in all the conditions I've faced this season. We have demo days coming up at our local resort this weekend and I find that I don't really want to demo anything. I just want to be out there on my Woodcarver. I guess that says something right there.